This recently refurbished holiday cottage has far reaching see and river views, looking over the roof tops of the famously pretty 200 year old fishing cottages of Irsha St. The views stretch out to Saunton Sands, Braunton Burrows, Crow point and Instow. 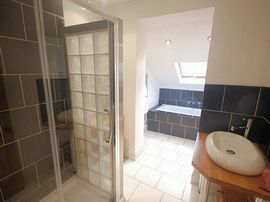 They can be enjoyed from the rear decking, kitchen, living and bedrooms. 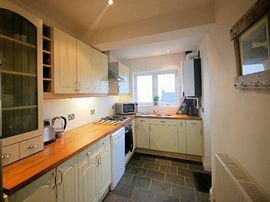 With just a short stroll into the heart of this traditional fishing village. � Sleeps 5, in 3 bedrooms. � Sea ; river ; beach views. � Beach within easy reach. � Modern kitchen and stylish bathroom. � Travel cot and highchair available. � Enclosed garden and decking to enjoy the views. Our holiday cottage looks over the Irsha Streets roof tops, the multi coloured houses line the length of Appledore's Irsha Street. The street is protected under a conservation planning order, as almost all the houses are over 200 years old. Situated in the middle is the famous Beaver Pub located on the sea wall. A short stroll to the quayside and numerous family pubs serving good food, shops, restaurants and art galleries all close by. Enjoy the bygone village era and watch the fishing boats bring in their catch, or take the 20 minute walk to Westward Ho!, with its two miles of golden sandy beach, Northam Burrows Country Park & Royal North Devon Golf Club. There is much to see and do in North Devon, with popular attractions including The Big Sheep, The Milky Way, Watermouth Castle and Dartington Crystal. In the evenings, relax on the enclosed decking with seating and views, or enjoy a meal in one of the local pubs. Nearby beaches are listed in proximity to Appledore: Instow, Saunton Sands, Croyde, Putsborourgh, Woolacombe to the north and Westward Ho!, Clovely, Hartland, Sandymouth, Widemouth, Bude (all are within 5-45mins drive). Great for families and explorers. Enclosed rear garden with decking, patio table and chairs all to enjoy the sea views. Local Services: Numerous beaches with easy reach, rock pooling, restaurants and pubs, art galleries to browse all a stones through away. Please email us for directions, we'll be happy to help. And recommend the best places for you to visit and enjoy. 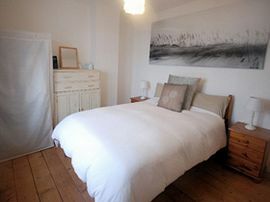 Prices start from: £350 per week, including fresh linen. Contact us for special offers on booking. eds720@gmail.com. "Stunning views, lovely bathroom & well equipped kitchen, we had a super holiday - Thanks very much". "We (Mum and 3 kids) enjoyed Rhyswood very much. 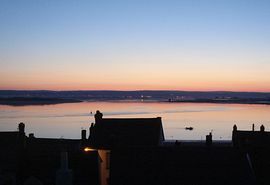 We have stayed in Appledore twice before and all agree this is the best house - for location, comfort, loved the decking and especially the views. Superb thank you very much !". "My Dad and I had a very relaxing week and loved the setting and views - Wonderful ". "We have enjoyed our week at Rhyswood and found the peace and quiet very relaxing" "Everything excellent, lovely kitchen and bathroom". "Wow what lovely views, we stayed from Saturday to Saturday and it was harder and harder to get out of bed, becuase we couldn't take our eyes off the beautiful views from the bedroom! We are going to miss the beautiful sea views, lovely cottage with everything we needed, we recommend it to all". "We've had a really lovely time here and think the house is realy well equipped, we were particularly impressed with the highchair and stairgate for our baby. Thanks again for a very relaxing and enjoyable holiday". "Your house is beautiful and we had a beautiful week. Thanks".